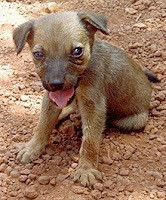 Canine Distemper, which is commonly referred to as “distemper” is a viral disease affecting puppies and dogs of any age. In recent months we have noticed relatively higher volumes of distemper cases in and around Colombo, Sri Lanka. While timely vaccination for canine distemper is the best method of preventing the disease, early identification of the signs and proper treatment can still cure affected puppies and dogs. The most common signs are nasal and eye discharge, coughing, diarrhea, vomiting, fever that may come and go, and seizures. Mildly affected dogs may only cough and be misdiagnosed as having "kennel cough." Mortality rate is highest in young puppies. Vaccination is the only way of prevention. Annual vaccination boosters are recommended. If your puppy/dog is not vaccinated for distemper, we highly recommend getting the vaccinations from a qualified veterinarian. If you notice such symptoms in your dog or puppy, it is crucial that you get them to a veterinarian as soon as possible. HI, I just have been reading your post and I have to say, Thank you for posting all these things. It's a relief because I have been searching for days how to just be with my new puppy and how should I care him from disease. There is no single job description for a veterinarian because there are so many different settings where one might work but a veterinary technician is great for companion animals.